March 25, 2017. Sorry for the long break between posts — things have been quite busy with our construction project here in Norway, and I’ve had no time to write. Last I left you, Easter break had arrived. But I got a little ahead of myself, and I’m gonna jump back in time now to catch you up on a few fun experiences that we had before, during, and after the holiday. 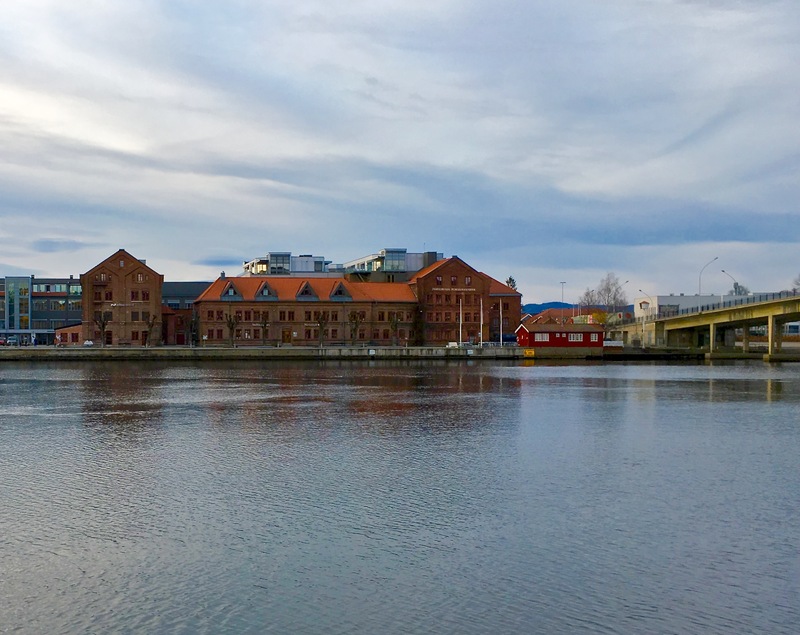 The original Porsgrund Porcelain Factory, founded in 1885, still sits picturesquely on the banks of the Porsgrunn river. 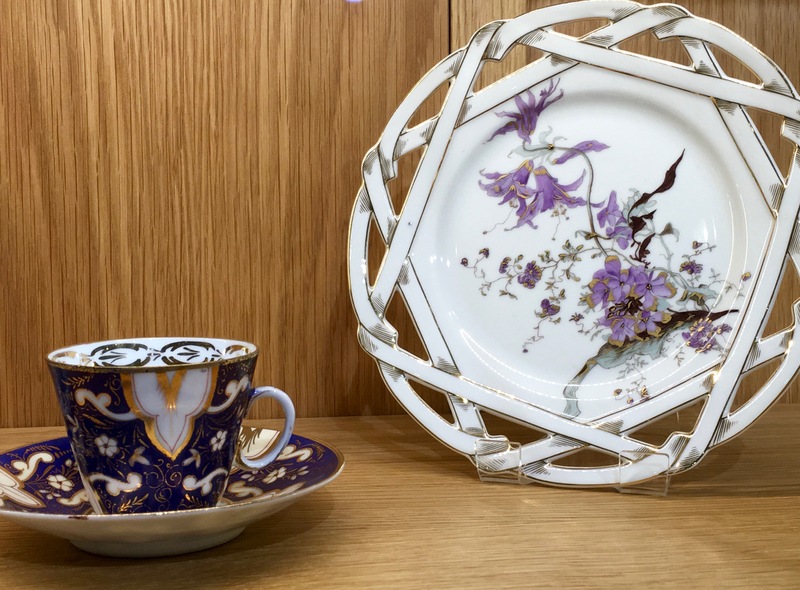 One Saturday afternoon, we headed southward in our rental car towards the town of Porsgrunn, the site of Norway’s oldest porcelain manufacturer. 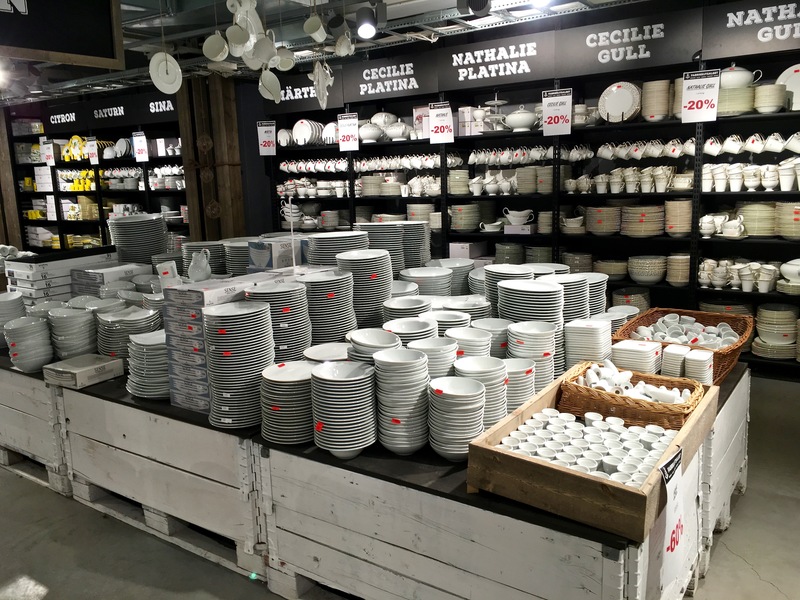 The original goal for our excursion had been to purchase some Norwegian dishes to go with our new Hadeland crystal, which we’d bought during a Yuletide excursion — see my post, A Hadeland Holiday. Yep, we’ve been bitten hard by the Scandi design bug while living here. A mural along the entry into the harbor hints at Sandefjord’s whaling history. But during the two-hour drive, Matthew did some quick scouting of other historic sights to see along the way. And that’s how we ended up in Sandefjord, a seaside town famous for whaling, minerals spas, and Viking historic sites. Since we’d had to work a half-day, we arrived just in time for a late lunch at Kokeriet, a harbor-side eatery. The place offered some excellent local brews and an outstanding fish soup and fish burger, plus lots of local lore. I’m thinking the cool roofline of the Kokeriet Restaurant is meant to resemble an open whaling boat, or perhaps whale baleen, as a nod to the town’s whaling industry. With its open fireplace, nautical vibe, and fabulous view of the harbor, Kokeriet captures the essence of “koselig” (“coziness”) that all Norwegians strive for in their interior décor. 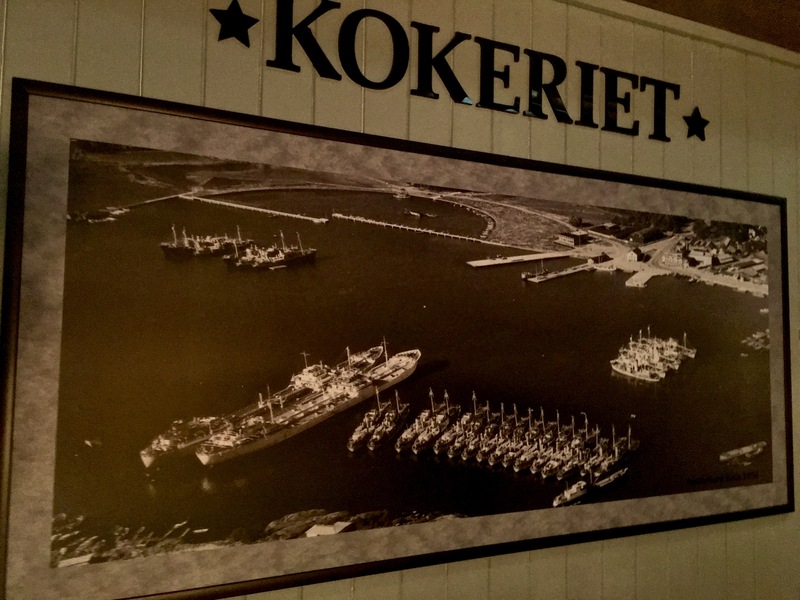 A photo mural in Kokeriet shows Sandefjord when its harbor was filled with whaling ships. 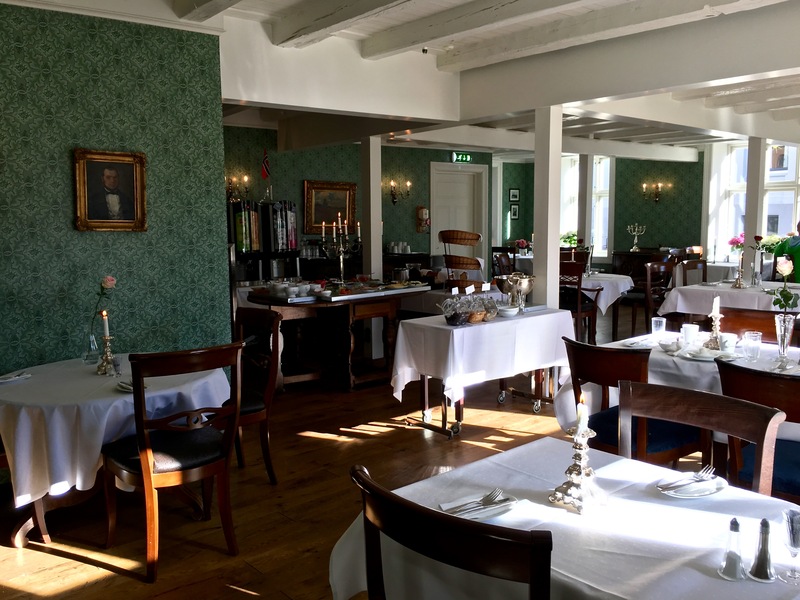 A quick tour around the restaurant gave us a visual overview of Sandefjord’s history as a whaling town. And let me just say up front, if you’re squeamish about the concept of whale hunting and downright appalled at the idea of eating whale, then you might want to skip the next couple of paragraphs — and also avoid looking closely at the photos on the restaurant’s walls, should you ever stop in for a meal. 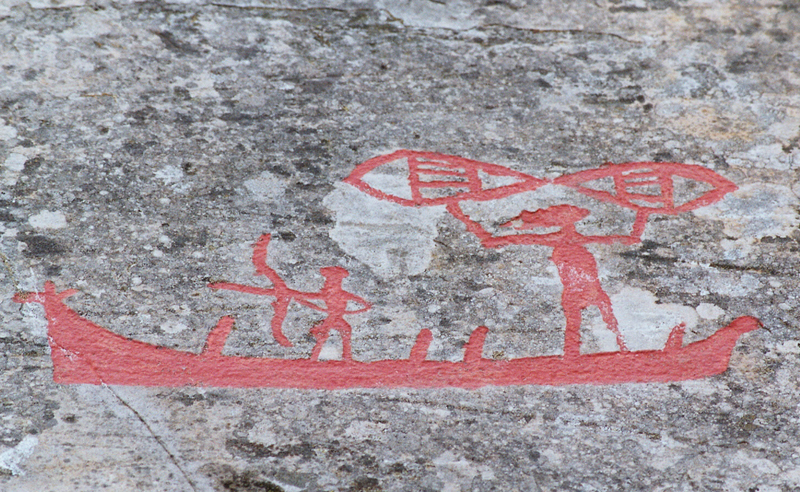 Some say that petroglyphs like this one from Alta, Norway, depict men fishing with nets and hunting whales or fish with a bow and arrow. To give you a bit of background, Norway has a long history of whale hunting. The ancient Norse sagas record disputes between Viking families over the rights to whale carcasses, and some claim that petroglyphs (rock carvings) of whales and armed men in boats, which date to the Stone Age, prove Norwegians have been hunting whales for millennia. 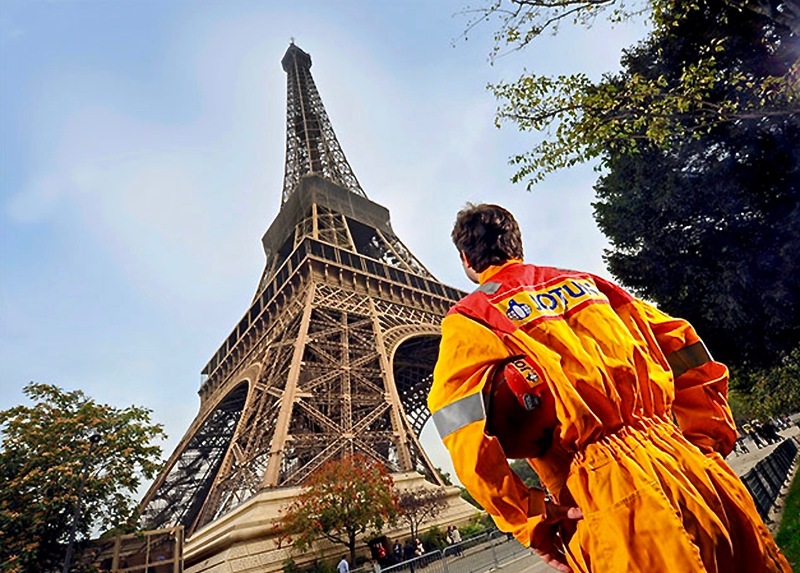 Yep, Jotun paint from Sandefjord, Norway, is what protects Paris’s Eiffel Tower from the elements. Across from the Kokeriet sits the “Southern Actor,” a whaling ship (now a museum) that highlights Sandefjord’s history as the center of Norwegian whaling until 1968, when the industry began to dry up. Yes, I look scarily excited to be manning this whale harpoon. Truth is, when we first pulled into the parking lot, I just thought it was some sort of military gun. Duh. I’m an idiot. Anyway, Norwegian whalers use harpoons with explosive heads that cause instantaneous death 80 percent of the time. The unlucky whales who don’t die immediately get dispatched with a rifle. I’m not justifying the practice, folks, I’m just relaying information about the industry. 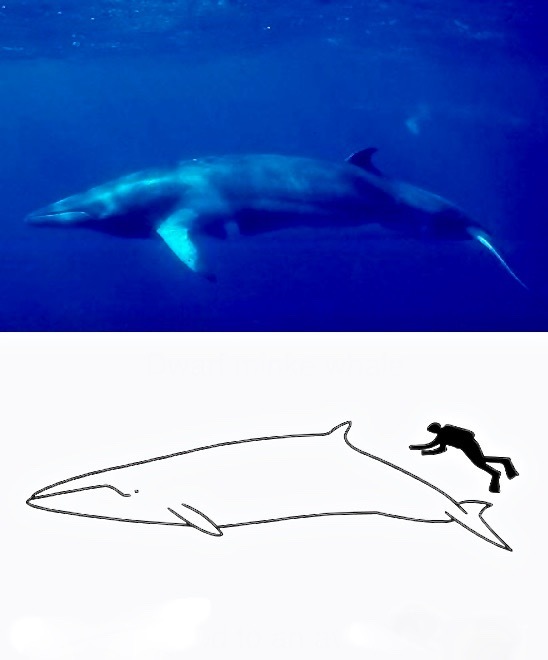 The minke whale is the second smallest baleen whale and is considered a species of Least Concern on the IUCN Red List. Norway’s annual quota hovers between 800-1000, although their actual annual whale catch typically measures only 30 to 60 percent of this number. Photo NOAA; Illustration Chris Huh, Wikipedia. Now for the part that will be offensive to many of you. Along with Iceland and Japan, Norway still hunts whales; specifically, only the minke whale (Balaenoptera acutorostrata). Keep in mind that whales have long been a food source for seafaring folks living in an Arctic climate. And in countries like Norway that were exceedingly poor for centuries, cheap meat like whale (leftover after processing the valuable oil) became a staple in many households. 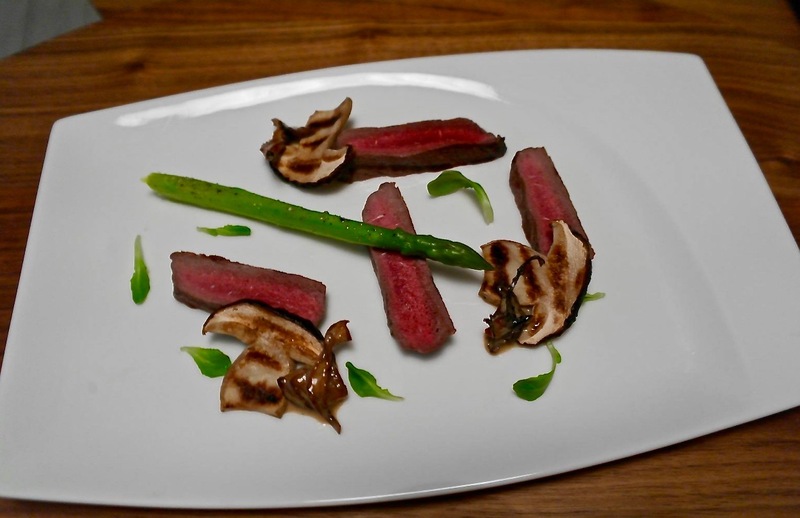 Today, it’s more common to see minke on the menu of Norway’s northernmost cities, but you’ll still find it offered as a delicacy in some of Oslo’s finest restaurants. Yep, this is grilled whale meat. No, it does not taste like chicken. To me, it has an iron-rich, bloody taste, almost like liver. Photo courtesy of Marius Tvethaug of Frøya Sjømat fish market at Mathallen, Oslo. To answer your obvious next question: yes, I’ve tried it. It’s kind of hard to avoid eating it at a business function, where to push aside a special offering would be viewed as rude. And lecturing your hosts on how barbaric their customs seem to you is not the way to forge relationships. By the way, I’ve also eaten sheep’s eyeballs in Israel, dined on horse meat in France, and tried lots of other unusual foods simply for the opportunity to connect with people. Being “non-judgy” is critical when making new friends. Let’s face it, most cultures have at least one food tradition that others view as weird or gruesome. For example, the Chinese consider cheese (soured, solidified milk) a low-brow food eaten only by unhygienic barbarians. And in parts of India, the European habit of slaughtering and eating beef (or any other animal) is considered repulsive and cruel. I’ve also been told by Hindus that Americans are particularly stinky, smelling like rotten flesh or roadkill because of how much meat we eat. It’s all a matter of perspective, folks. Okay, enough about that. Now for a less controversial subject. Dishes. Matthew jokes that when I turned 30, a latent “dish gene” kicked in that he supposes I inherited from my china-mad grandmother. He claims that overnight, we went from owning one set of tableware to three. But let’s be fair. Matthew himself bought me a set of antique Limoges china for our first Christmas together, plus we inherited a set of Fiestaware from his grandmother, so the obsession with beautiful porcelain is kinda mutual. In other words, I didn’t have to drag him to the Porsgrund Porselen Factory to learn how they made their dishware. I’m giving Johan Jeremiassen a cuddle for his herculean efforts to save his hometown. He founded Porsgrund Porselen in 1885, and it’s Norway’s oldest porcelain factory still in operation today. Christina, a docent at the Factory Museum, gave us an absolutely fantastic tour, showing us how Porsgrund Porselen has grown and changed over the years. The company’s story is actually really inspiring: the founder, Johan Jeremiassen, was a shipping magnate who exported feldspar to Germany for the manufacture of Meissen porcelain. His hometown of Porsgrunn had been particularly hard hit by the global economic depressions of the late 1800s, and Jeremiassen conceived the idea of creating his own porcelain factory to provide jobs for locals. Johan Jeremiassen brought pottery engineer Carl Maria Bauer over from Germany to help set up Porsgrund’s factory. After leaving Porsgrund, Bauer went on to help start up Rosenthal porcelain in Denmark. As you can see, Bauer’s earliest efforts focused on traditional designs that mimicked Meissen and other famous European china. He sunk all his own money into it, almost bankrupting himself in an effort to keep his neighbors employed, and died two years after the factory opened. But his wife wouldn’t let go of the dream and made significant changes to the company, firing the German pottery engineer who was intent on making pricey copies of other companies’ pottery. Instead, Porsgrund began to focus on industrial products such as insulators for power lines and hygienic dishware for hospitals, which became the company’s (and the town’s) bread and butter. Eventually, Porsgrund branched out into daily china and art pottery designed by homegrown talent. For many years, the chief artistic director was a woman, Nora Gulbrandsen, who ushered in an era of modernism and minimalism that helped set the stage for Scandi design worldwide. Porsgrund still reproduces some of her original lines today, as well as several historic and contemporary new patterns. At the factory, you can watch porcelain being made and artists painting patterns free-hand on the pottery. 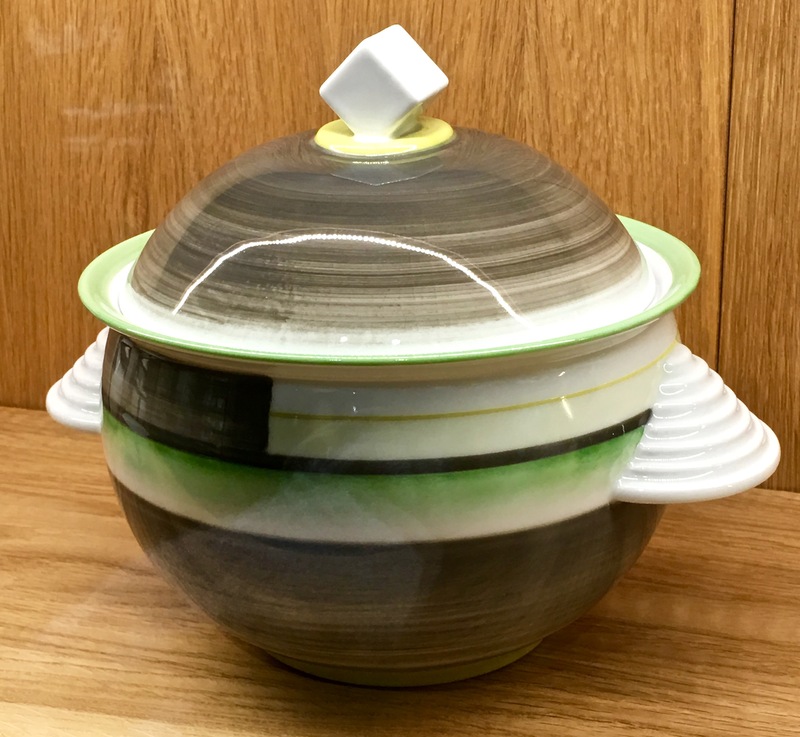 Check out some more gorgeous pieces and fun facts about porcelain and Porsgrund by clicking through the gallery below. 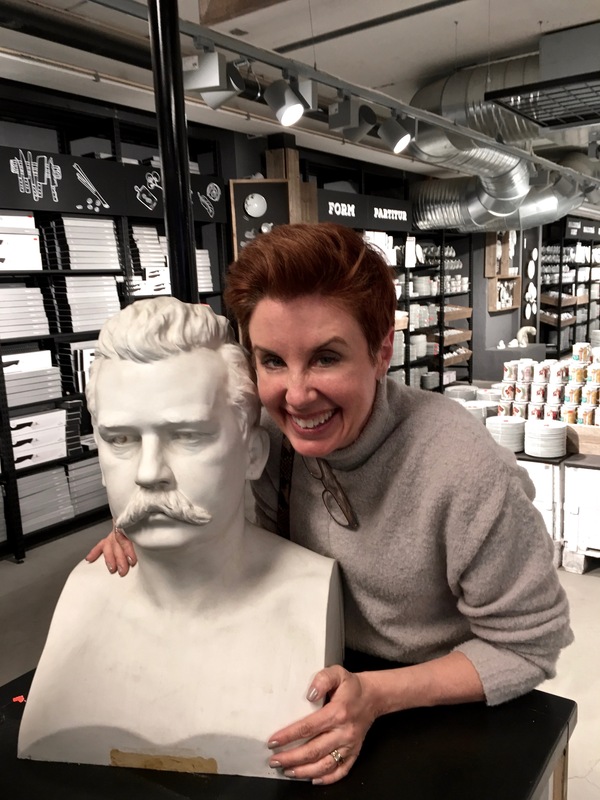 Porsgrund’s museum opened in 2015, and if you’re a dish and pottery lover like Matthew and me, you’ll really enjoy it. Check out this awesome plate featuring an illustration by Theodor Kittelsen. You’d probably recognize one of his many fantastic illustrations of fairy tales and myths that depict trolls. A classic Scandi pattern from the 1960s could still be a hit today. I love this adorable camel, both for his lumpy charm and his backstory. During WWII, when the Nazis occupied Norway, Porsgrund was cut off from its supply of kaolite clay. So designers dived to the bottom of lakes and rivers to dig up mud clay to make art pieces like this guy. Norway has huge supplies of feldspar and quartz — vital components in producing porcelain — but no kaolite clay, which must be imported elsewhere from central Europe. Here, Christina explains the details of porcelain production. Matthew already has some familiarity, as he’s an amazing potter himself and has thrown porcelain on a wheel. Another cutting-edge design by Nora Gulbrandsen. How modern is this? Of course, since it was Saturday, the factory was officially closed. But if you’re there on a weekday, you’ll see artists using tiny paintbrushes to free-hand the patterns on the Bogstad Straw line. Porsgrund is also known for its line of porcelain animals, often Norwegian wildlife such as this Arctic hare, polar bears, and seagulls. I’m not much for dust-collecting tchotchkes, but this guy is pretty damn adorable. Check out these bright 1970s Porsgrund pieces, eye-catching and relevant even after so many years. I became enamored of these little tile paintings of Norwegian scenery done by Porsgrund artist Jan Harr, who originally made them to decorate her office. Soon the company began reproducing them, and they sold like wildfire. Today, most every Norwegian has at least one of Harr’s pieces hanging in their “hytte” (mountain cabin). I found this one at a flea market shortly after our visit to Porsgrund. The full array of “Sense” porcelain — a favorite tableware line for both Norwegian restaurants and households. Since it was a Saturday, the factory itself was closed, so we made a beeline to the outlet, where we completely filled the trunk of our car with every available piece from the company’s “Sense” product line. Truly, there are at least 30 different types of “Sense” plates, bowls, cups, saucers, and serving pieces, depending on whether you’re looking for square, oval, or traditionally round tableware. We bought a little mix of each, so we’d have dishes for every conceivable cuisine — and at a 20 – 70 percent savings! What’s not to like? The Kong Carl (King Carl), one of Norway’s oldest hotels, was first a private residence for a merchant, then later a ship captain, before being turned into an inn by the captain’s widow in 1780. “No, but you’ll see,” he winked, and his assistant joked, “You’re giving them that room? 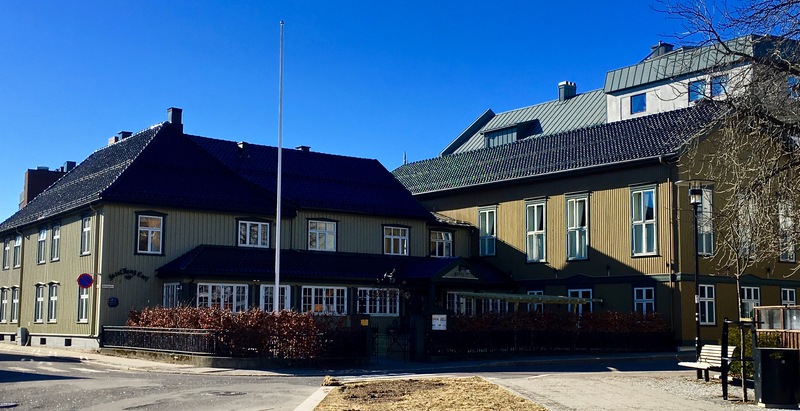 Wish them luck.” We made our way through the hotel, gaping at the gorgeous furniture and stately spaces, then nosily poking our heads into the dining area to get a glimpse of a Norwegian wedding reception (lots, and lots … and lots of toasting). When we finally reached our attic room, we opened the door and discovered a huge, winding warren of rooms with a kitchen, two parlors, a grand chandelier, and enough beds to house a family of ten. But no ghosts. I’m guessing the assistant’s wish for good luck was so that we’d be able to find our way back out to the main hallway after threading our way through the labyrinth to the master bedroom. Oh yeah, I blend. Some of these mounds are real monsters, measuring more than 10 feet high and up to 35 feet in diameter. The next morning dawned bright and sunny, so Matthew and I decided to skip museums and focus on outdoor activities. 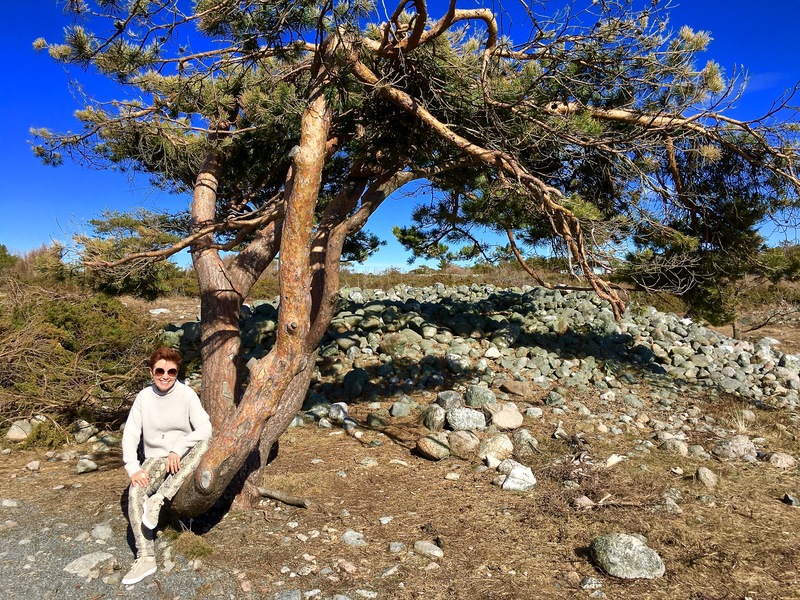 Our first hike was along the rocky stretch of shoreline known as Mølen Beach — an ancient seaside burial site hosting more than 200 stone cairns. Made up of basketball-sized boulders, these mounds range from 16 impressive hills to around 190 smallish lumps about the size of modern graves. The oldest mounds sit tucked amongst a grove of fairy pines that have been dwarfed and twisted into sculptural shapes by the wind. 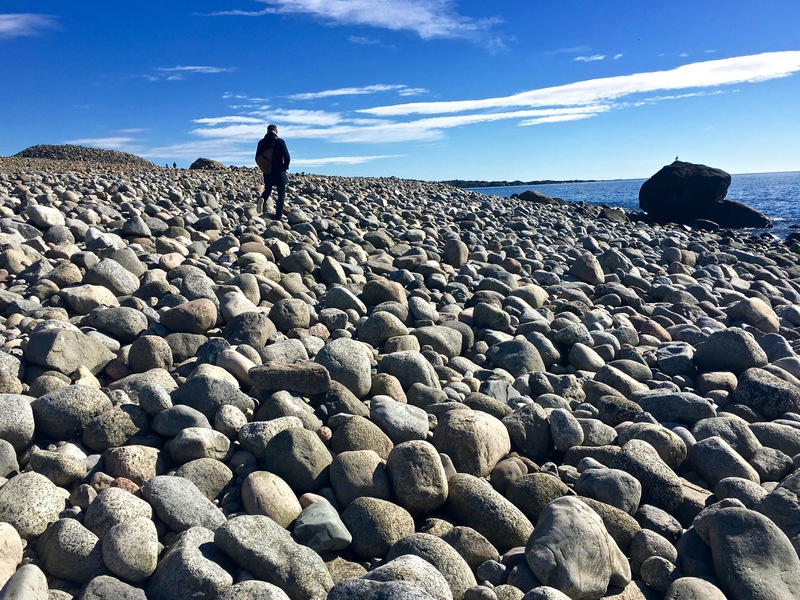 The beach’s name Mølen comes from the old Norse word “mol,” meaning a mound or bank of stones. The oldest mounds, which sit higher up and further away from the ocean, likely date to the Early Iron Age, around 500 B.C. – 550 A.D., while the younger ones, which march in long rows near the water’s edge, might possibly date to the Late Iron Age/Viking Era, about 550 – 1050 A.D. As with any mysterious ancient site, speculations abound as to why someone would spend so much energy moving so many big rocks into piles. The current ruling theory is that the biggest cairns marked the graves of chiefs, while the rows of little mounds were for lesser folk. The mounds, which can be seen easily from the sea, may have also acted as navigational cues for Viking sailors. It’s believed that ancient shipping lanes ran along the coastline here. In reality, no bodies have ever been discovered here. Some burned stones in the center of the piles might indicate that cremation was part of the burial ceremony. But some of the mounds may also be purely commemorative. Excavations into one of the elongated, boat-shaped cairns turned up iron nails and burnt wood dating to around 400 A.D. Archaeologists think that the mound might mark the site of a shipwreck or naval battle, and that perhaps the captain and crew were either buried under neighboring rock piles, or simply memorialized in the monuments (big round mound = captain; rows of little mounds = crew). Click on the photos below for a better perspective. An aerial of Mølen Beach gives you a good idea of the layout. Note the oldest mounds in amongst the scrubby trees furthest from the water. (The biggest ones are marked with an “R.”) As the land uplifted over millennia, the beach grew wider and folks added more burials closer to the water. (This geological activity is what helps archaeologists date the mounds.) Along the shore you can see a ship-shaped mound, a “captain’s” mound and rows of “sailor” mounds. Here, you can see the large “captain’s” mound in the background, with a row of his “sailors” stretching out across the beach before him. 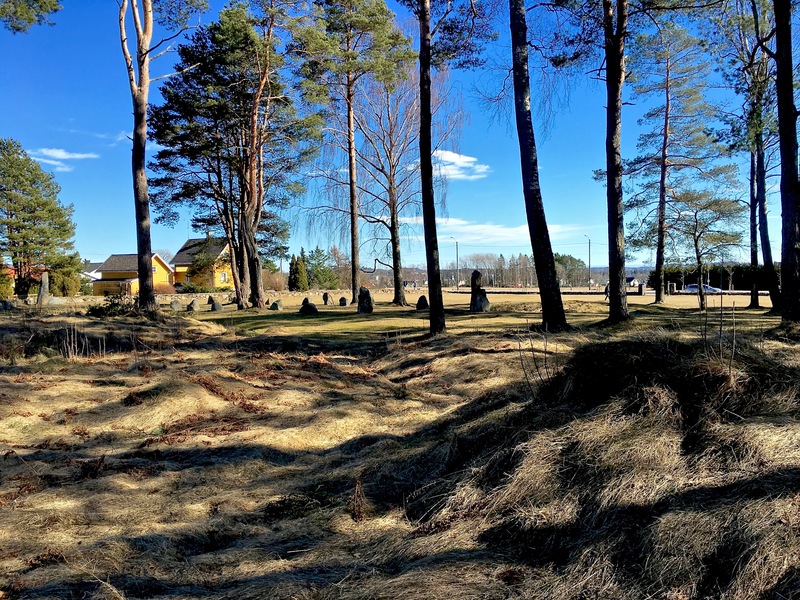 A panoramic shows you more of the parallel rows of smaller mounds that theoretically mark the graves of low-status men. 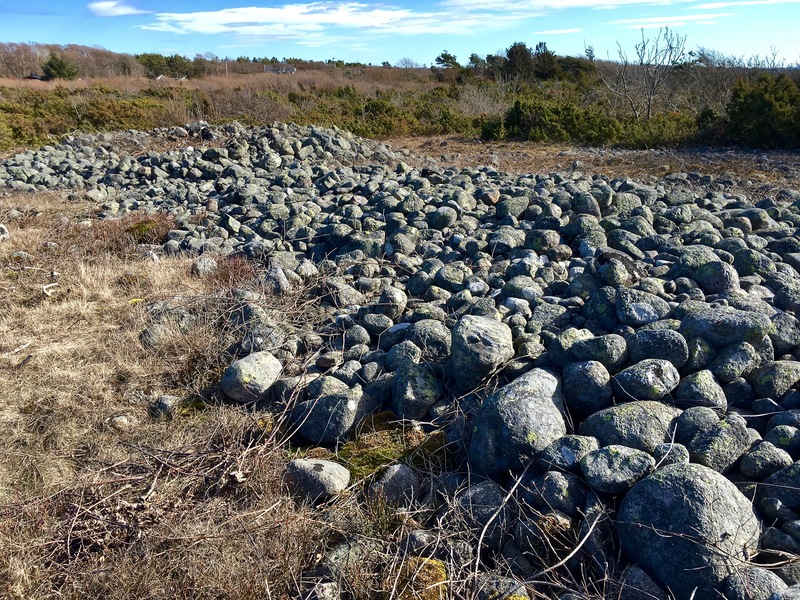 Look closely, and you can see that these mounds have a notch cut into them — evidence of “haugbrott” (meaning “mound-breaking”) by Iron Age Vikings. As Matthew and I circled around the mounds, we noticed that many had a V-shaped gash in their sides. Archaeologists who claim that the mounds are actual graves believe that this is evidence of the ancient practice of haugbrott: the ritual removal of the dead, which was common during Viking times. Why did the Vikings plunder the graves of their own ancestors? Some think the bodies were removed for the purpose of necromancy (forecasting the future by communing with the dead), or to prevent the souls of the dead from haunting the living. Norse sagas often tell tales about troublesome spirits hanging out around stone burial mounds like these. Keeping your balance while walking over these boulders is no joke. Note how the mounds can be easily seen from the sea. 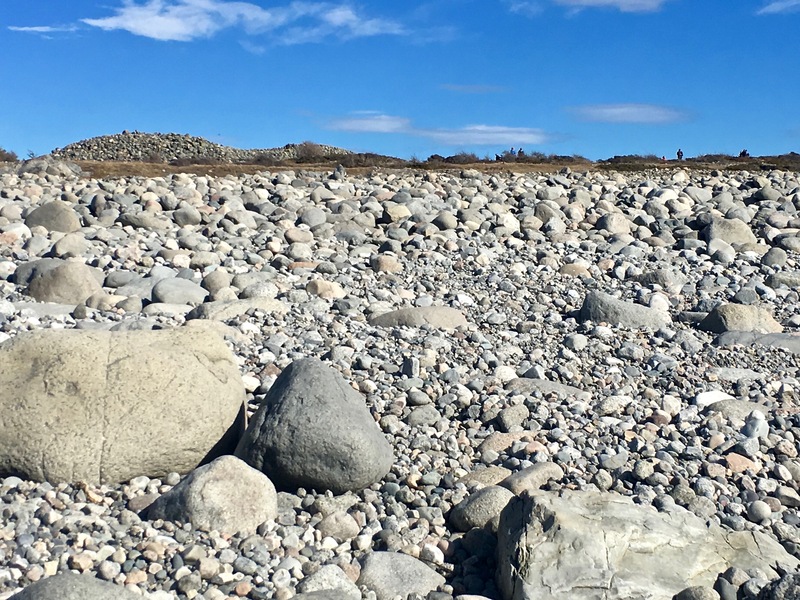 Matthew and I thought about scaling one of the mounds to get a bird’s-eye view of the sea, but the loose rocks seemed to be real ankle-breakers. We had our suspicions confirmed when a group of people passed us escorting an older man back to his car, his head gushing blood from a tumble he’d taken from the top of one of the cairns. 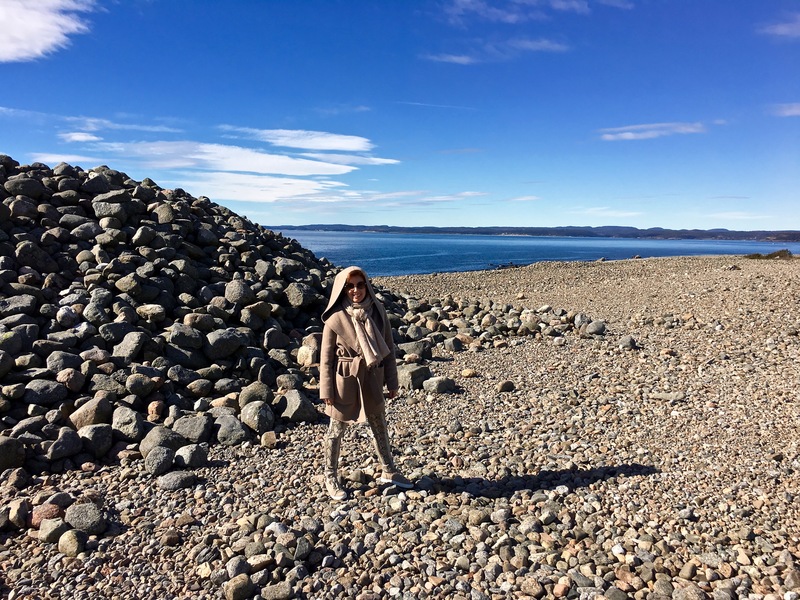 For safety’s sake, we settled for parking ourselves on a rock and squinting out to sea, trying to imagine Viking ships sailing by, judging their position using the mounds as mile-markers. Nope, these aren’t graves. 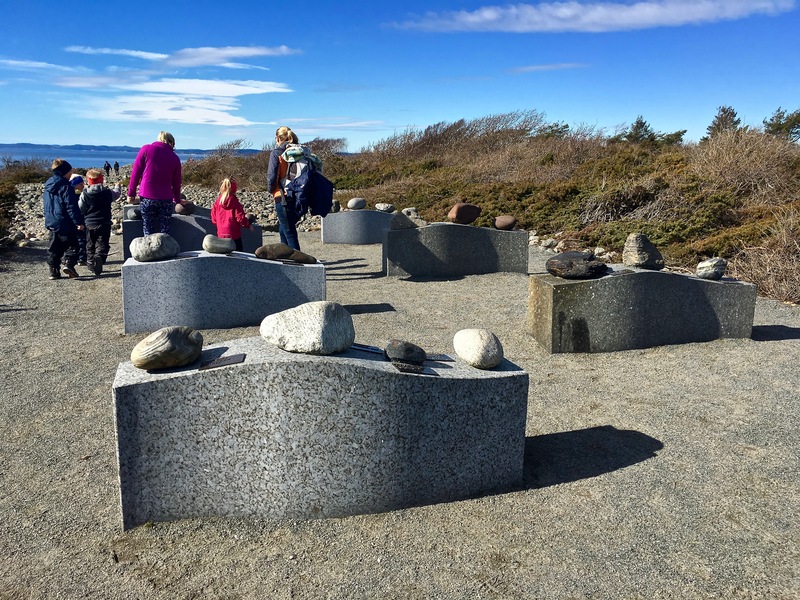 They’re educational displays showing you all the pretty rocks from different parts of Scandinavia that took a ride on a glacier and ended up here at Mølen Beach. While lying there, contemplating life as an Iron-Age sailor, we began to inspect the astonishing variety of stones that littered the beach. It’s not like the ancients had to look far and wide for mound-building materials. 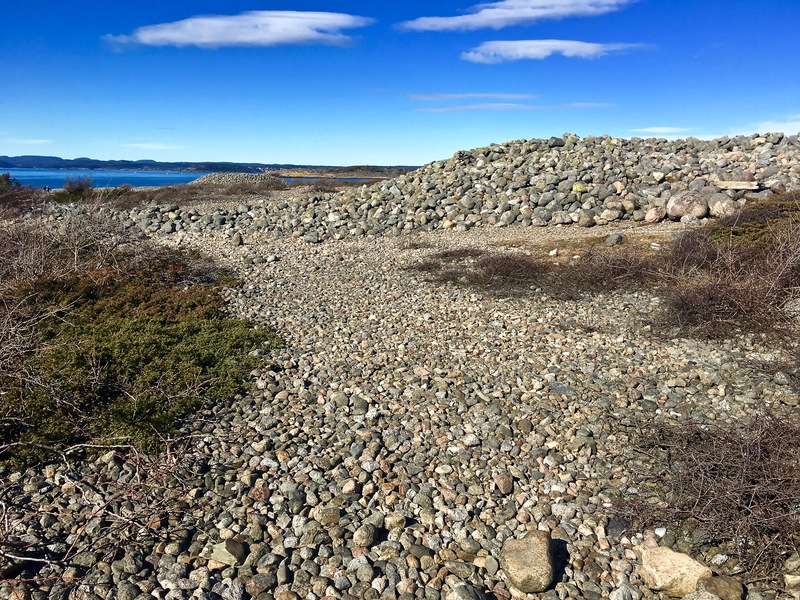 A nearby educational display had explained that Mølen Beach is essentially a moraine — a huge, winding ridge of rock left behind by a retreating glacier that sat parked in this spot for about 300 years, long enough to unload quite a diverse pile of gravel. Some of these colorful, non-native rocks had apparently immigrated from as far away as Denmark. Geology aficionados can click on the photos below for more fun facts. In this aerial photo, you can see (1) the grave mounds, (2) the “Ra,” the Norwegian word for the gravel ridge that the glacier left behind about 12,300 years ago, and (3) the remains of the Brunlane shield volcano’s flanks and lava flow stretching out into the sea. 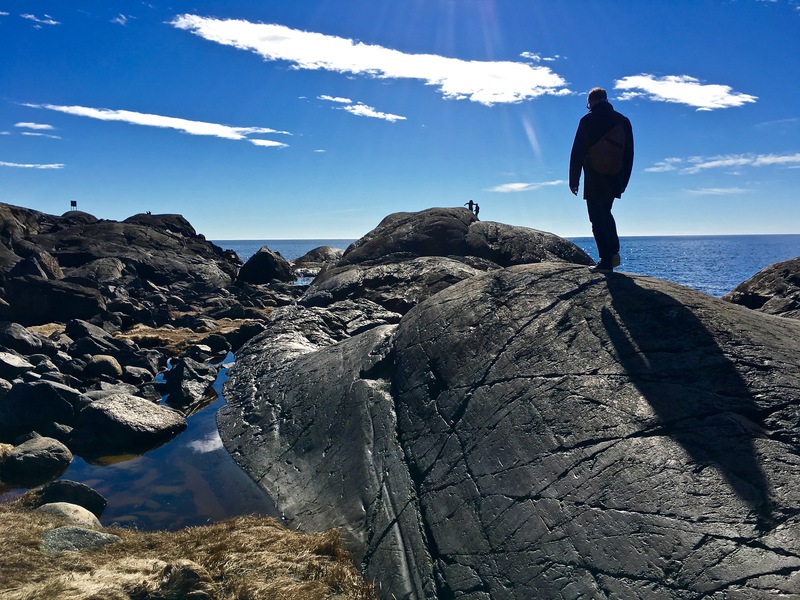 This image gives you an idea of where some of the rocks migrated from around Norway to reach Mølen Beach. You can also see how close Mølen is to Oslo, for those of you interested in paying the site a visit. Looks like Matthew is taking a stroll down a blue whale’s back, right? It’s actually a huge finger of lava that sticks out into the sea. We toddled shakily over the enormous cobbles for awhile, listening to the crackling noise they made rolling against one another as the surf surged. The sound was so like that of breaking bones that I found myself gritting my teeth and wincing. Eventually we decided to stop challenging our sense of balance and made our way to a smoother section of the beach covered by an old lava flow. The landscape here is fantastical. The blackened fins of a prehistoric shield volcano reach out into the sea, looking like beached whales glistening in the sunshine. Click through the gallery below for more gorgeous views. This image shows you the stark contrast between the glacial gravel beach in the background and the darker, smoother volcanic terrain in the foreground. Look closely, and you can see the alternating layers of volcanic ash (brown) and lava (black). Cool little tidal pools form along parts of the old volcanic formation. Check out the mussels and anemone. See how the glacier scoured the rock smooth, revealing the folds of lava that lay within it. Note the crowd of folks walking along the North Sea Trail, which stretches along the shore here and runs more than 3,100 miles (5,000 km) along the coastlines of Norway, Sweden, Denmark, Germany, the Netherlands, England, and Scotland. As you can see, the modern world has closely encroached on the Elgesem gravesite. Only 21 of the original 38 stones survive intact today. The ship formation measures roughly 131 feet long by 23 feet wide (40 m x 7 m) and is oriented on an east – west axis. 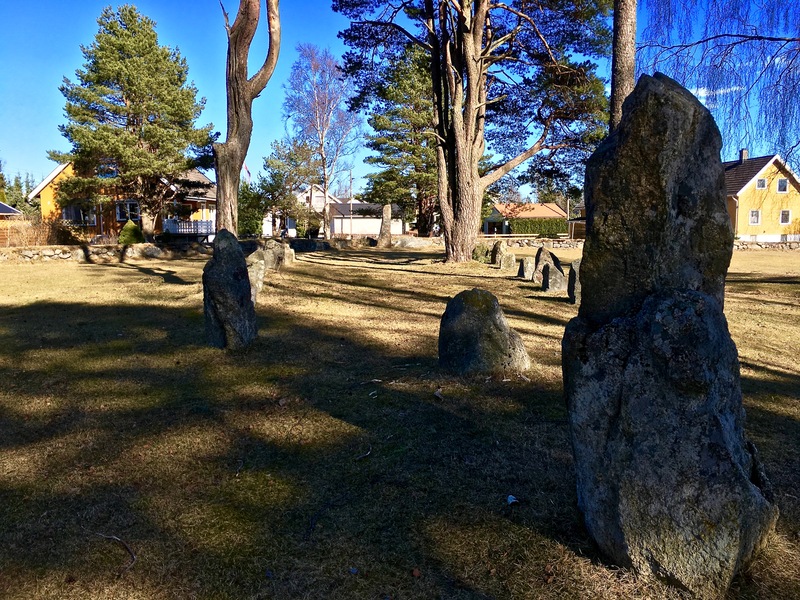 By around lunchtime, the crowds began to get pretty intense at Mølen, so we hopped back in the car and headed over to our next ancient cemetery, Elgesem. Here, rather than a ship-shaped cairn, we found a ship-shaped stone circle bordered by a small field of eight burial mounds. These kinds of stone ship formations are fairly common all over Scandinavia, but I’d never seen such a huge one up close. The “bow” and “stern” of the boat are marked by bautas — tall monoliths that are thought to mark grave sites and perhaps also act as a kind of astronomical calendar. It’s thought the field originally contained 20 to 30 burial mounds, but only eight remain today. Artifacts recovered during excavations tell us that the mounds were used from 500 B.C. to 1000 A.D. When the site was excavated back in 1870, archaeologists found a runestone atop one of the mounds, inscribed with the runes symbolizing A L U. The meaning and use of the word alu seems to be hotly debated. Taken at face value, it simply translates as “beer” — in fact, our word “ale” derives from it. Strangely, the word seems to be graffitied on lots of different runestones and gravestones all over Scandinavia. 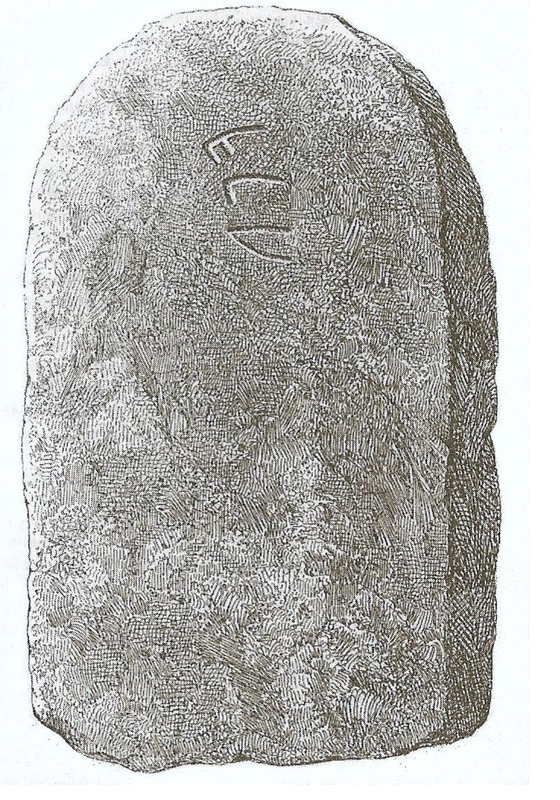 The Elgesem Runestone dates to around 400 A.D. It’s about 5.6 feet tall (172 cm) by 3 feet wide (90 cm) by 7 inches thick (18 cm), and it now resides at the Viking Ship’s Museum in Oslo. Yeah, yeah, we all know the Vikings were a hard-drinking lot. And yes, literary sources tell us that folks traditionally got hammered during nine-day burial rituals. (Beer was an important part of pretty much every Viking ceremony.) But linguists think the frequent appearance of alu on grave markers was more than just a common epitaph carved into the tombstone of the town drunk. Neither was it likely scrawled by devoted mourners who wanted to give thanks for plentiful liquor during the funeral. Old Norse poems and the Icelandic sagas tell us that alu is a “charm word” or an “ale rune” given to mankind by the Valkyrie Sigrdrífa to help ward off evil. In other words, it was probably carved into the gravestone to invoke a kind of protective runic magic that would either safeguard the spirit of the dead during his journey to the afterlife, or keep his ghost at bay so it wouldn’t bother the living. 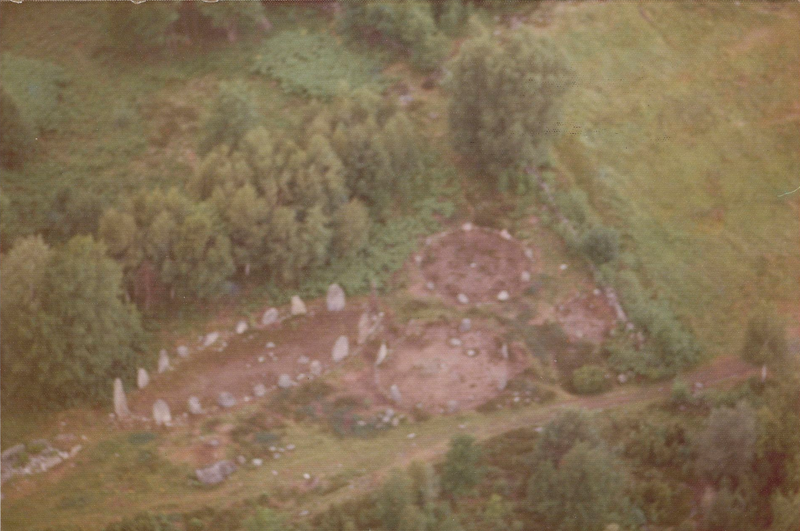 Here’s a kinda fuzzy aerial photo from 1973 showing the basic layout of the two stone ship formations and three stone circles at Istrehågan. Photo from Widerøe / Vestfold Museums. Matthew and I sat for awhile, enjoying the dappled sunlight filtering down through pines and basking in the peace of the place. But of course, we’re not ones to let the grass grow under our feet, so within ten minutes, we’d jumped back in the car. 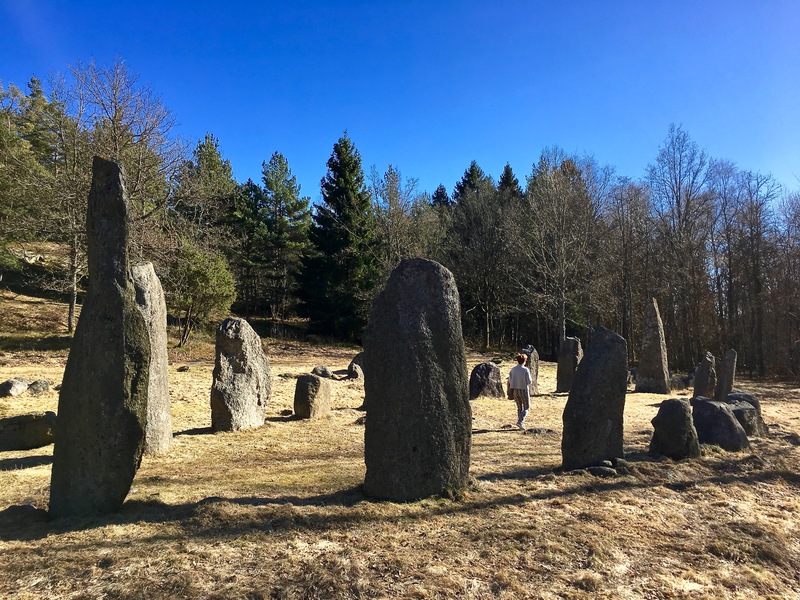 A series of crazy turns down back-country dirt lanes brought us to Istrehågan, our final destination and last stone-circle site — hopefully you can handle just one more. Check out the largest of the ship-shaped graves. Might give Stonehenge a run for its money just for the cool Viking ambience. 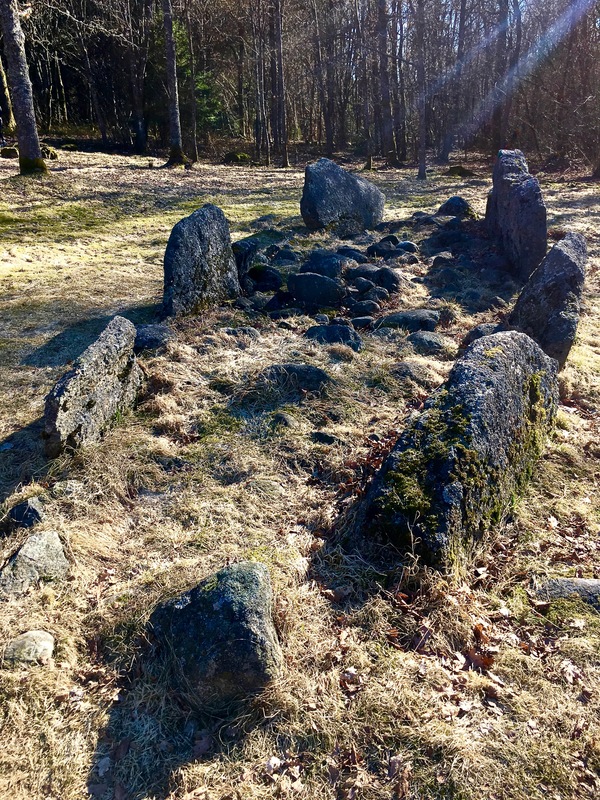 Istrehågan is an archaeological bonanza, with two stone ship formations, plus three stone circles. The largest ship stands 82 feet long (25 m) and consists of 18 standing stones, again with towering bautas marking the prow and stern of the boat. In the middle of this huge elipse (thought to represent a longboat), is a kind of fire pit, probably used to prepare food for a funeral ritual. Excavated in the 1960s, the center of the grave also contained hair combs, stone gaming pieces, charcoal, bits of iron, pottery and burned bones that were probably remnants of cremation burials. This ship-shaped grave is my favorite. It really looks like a stone boat, complete with oarlocks. Archaeologists found a grave in the center of each of the two largest stone circles, one which also contained a whetstone for sharpening iron blades. Luckily, we managed to get in some decent photos before a huge busload of druidic Norwegians showed up. They canvassed the area with their guide, then everybody pulled out divination rods and started stripping down naked. That was our cue to exit and head for Oslo — and no, I have no photos of the elderly, portly, hairy, radioactively white Scandinavians in the buff to share with you. Sorry ’bout that. I know you’re disappointed.